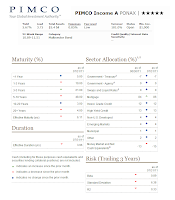 PIMCO Income fund (PONAX) is one of the best rated taxable bond mutual funds. 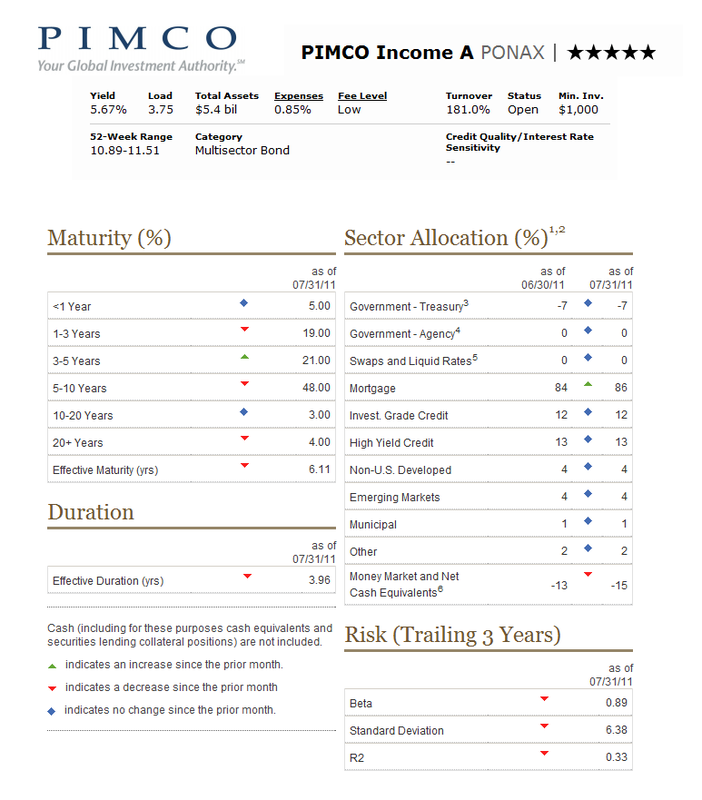 PIMCO has been well known with its bond fund investment. The fund's review can be found below. The PIMCO Income Fund investment seeks to maximize current income. It also tries to provide long-term capital appreciation as its secondary objective. The fund invests >65% of total assets in a multi-sector portfolio of fixed-income instruments of varying maturities. It may invest <50% of total assets in high-yield securities rated below investment-grade but rated at least Caa by Moody’s, or equivalently rated by S&P or Fitch, or, if unrated, determined by PIMCO to be of comparable quality. This PIMCO bond fund may invest <20% of total assets in securities and instruments that are economically tied to emerging market countries. Daniel J. Ivascyn has managed this taxable bond fund since this fund was introduced to public in March 2007. The expense ratio of this fund is 0.85% per year. It charges 0.25% 121b fee and 3.75% front end sales load. It shares 5.69% yield. The last dividend distributed was in June 2011 ($0.05). This fund uses Barclays Capital U.S. Aggregate Bond and Lipper Multi-Sector Income Fund Average as the fund’s benchmarks. The fund’s effective duration is 4.29 years, and the fund’s average maturity is 6.57 years. The minimum balance to invest in this best rated bond fund is $1,000 for brokerage account. This top rated multisector bond fund requires $50 for the minimum subsequent investment. There is no retirement (IRA) account available. This PIMCO fund can be purchased from 59 brokerages, such as JP Morgan, Scottrade Load, Vanguard, Pershing Fund Center, Morgan Stanley Advisors, Prudential Retail, Raymond James, Common Wealth Core, LPL SAM Eligible, Matrix Financial Solutions, etc. Investor can choose from the other classes of this fund like Class C (PONCX), Class D (PONDX), Class P (PONPX), Class R (PONRX), Class Other (PIINX), Class Other (PONPX), and Institutional Class (PIMIX). The PIMIX class has 7.0% dividend yield and it also has 0.40% expense ratio. As of June 2011, the top 5 sectors breakdown of this PIMCO’s best fixed income fund are Mortgage (84%), High Yield Credit (13%), Investment Grade Credit (12%), Emerging Markets (4%) and Non-U.S. Developed (4%). According to the fund prospectus, the Principal Risks of this fund include: Interest Rate Risk, Credit Risk, High Yield Risk, Market Risk, Issuer Risk, Liquidity Risk, Derivatives Risk, Equity Risk, Mortgage-Related and Other Asset-Backed Risk, Foreign (non-U.S) Investment Risk, Emerging Markets Risk, Currency Risk, Issuer Non-Diversification Risk, Leveraging Risk, Management Risk, Short Sale Risk, etc.